How Dependable Are Your Meter Readings? There is no arguing that digital multimeters are vastly superior to analog meters in many - maybe even most - ways. However, analog meters still have applications that make them indispensible in situations like monitoring slow variations in parameters and for quick visual approximations of values. One example is looking for variation of voltage or current levels under varying loads. Yes, digital instruments are available that emulate an analog display in certain modes, but that just proves the point of he usefulness of an analog movement. Another is the familiar control panel filled with meters where clusters are trimmed to be centered or at one extreme when the system is running optimally. Yes, effectively the same result can be obtained with digital readouts and colored status lights - and often is - but for a glancing status scan, it's hard to be the needle (IMHO, of course). Here is Part 2 of this series. Fig. 2 - Illustrations detailing the points discussed in the text. Rare indeed is the Service Man who realizes just how, why, and to what extent his service meter readings may be inaccurate - and how much it really matters! This article explains, simply and expertly, the entire subject of meter accuracy. The author's published works include his well-known "Radio Physics Course," "Modern Radio Servicing," etc. How accurate is the voltage reading you just took on that receiver? How accurate are the meters you are using in your service work, anyway? Fig. 1 - Breakdown chart of the various causes of errors in test meters. Are you one of those trusting Service Men who think that just because a meter is fairly new or expensive, it will give readings that are 100 per cent accurate at any point on the scale? Or, on the other hand, are you one of the suspicious but disillusioned type who has tried to check the accuracy of the meters in his test instruments, only to find that no two readings agree exactly? In either case, you (in common with most radio Service Men) are the victim of an incomplete, or inaccurate knowledge of electrical instrument construction and operating characteristics, for, anyone closely associated with electrical instrument design and manufacture is well aware that errors exist in all instruments, and will admit it freely. 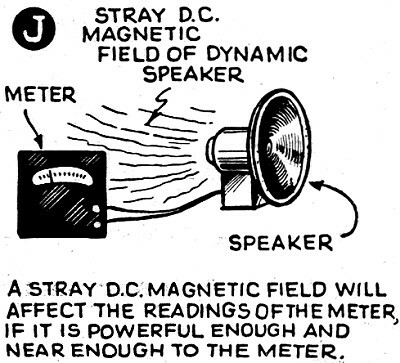 Fortunately, the entire subject of meter accuracy is fairly simple - and interesting. Perhaps we can clear up, in this series of articles, some of the more troublesome difficulties. First of all, get this fundamental fact firmly in your mind: no commercial type electrical indicating instruments are guaranteed to read 100 per cent correctly at every point on the scale - only very expensive laboratory-type instruments approach such perfection. That means that you cannot, and should not, expect the readings you take on your servicing meters to be 100 per cent accurate. They really don't have to be - but that's another part of our story. What you should know is, how large the errors are, what their origin is, how you can minimize them, and whether they will seriously affect the usefulness of your measurements. The accuracy, sensitivity, and reliability of an electrical instrument are determined by its design, the quality of the materials used in it, the care taken in its construction, the accuracy with which it has been assembled and calibrated at the factory, and how roughly it has been handled since made. In order to make meters that can be priced within the reach of the average user, accuracy has to be sacrificed somewhat. Meters can be purchased for from less than a dollar up to several hundred dollars. Naturally, the more one pays for an instrument, the better the quality of materials used in it and the more accuracy and care exercised in its workmanship and calibration. The general run of meters used in present-day high-grade servicing instruments represent a good common-sense compromise between accuracy and price - they provide sufficient accuracy (around 98 per cent for D.C. instruments and 95 per cent for rectifier type A.C. instruments) for the general run of servicing measurements to be made, and are priced within the limits of the Service Man's pocketbook. Their manufacturers deserve unstinted praise, for by working out clever designs, careful selection of materials, and taking advantage of every technical advance and possible manufacturing economy, they have succeeded in making really fine, rugged, instruments available to the Service Man at reasonable cost. But the Service Man should realize that these instruments are not perfect - no "manufacturer claims them to be! Practical construction difficulties make absolutely precise .instruments unobtainable. 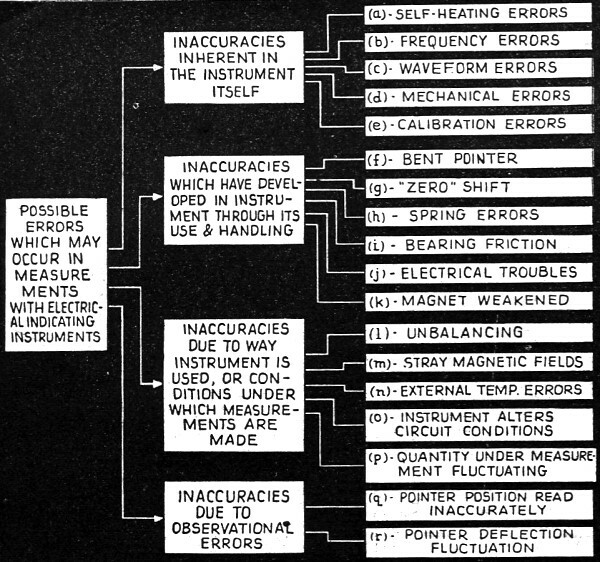 A knowledge of the errors likely to occur, the origin of these errors, and the means used to make them negligible (or as small as possible) is of value in enabling one to use electrical instruments intelligently and obtain the best results from them under working conditions. 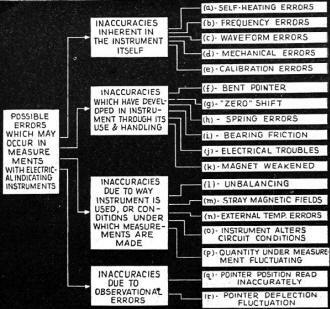 Now that we are reconciled to the fact that errors do exist in measurements made with electrical instruments, let us see what they are and what may cause them. All of the common inaccuracies have been grouped and arranged for quick reference in a convenient chart in Fig. 1. Notice that there are 4 main sources of inaccuracy: (1) those which are inherent in the instrument itself due to its design and construction, and which may be present even in brand new instruments; (2) those which have developed, in the instrument as a result of its constant usage, rough handling, etc. ; (3) those which occur because of the particular way the instrument is used, or the conditions under which the measurement is made; and, (4) those which occur through inaccurate reading of the pointer position by the observer. In the chart, each of these is further broken down into its contributing causes. Let us review these contributing causes of error briefly; so that we may understand why they may be present and what effects they have on the readings. Naturally, the error which may result depends upon the value of the current or voltage under measurement and upon the length of time that the instrument is kept in the circuit. Fortunately, since the currents involved in the measurements made in radio service work are fairly small and the instruments are kept in the circuit only for a very short time, this source of error is not a very great problem. By making the shunts and multiplier resistors of resistance materials which have a very low temperature coefficient of resistance, their resistance change due to heating is minimized. The increase in resistance of the copper movable coil is compensated-for by using a control-spring material which produces a restraining spring that weakens just the right amount with change of temperature so as to offset the effect of the resistance increase of the movable coil. By employing these refinements in design, the actual error due to self-heating in commercial instruments is kept so low that it is negligible. (B) and (C) Frequency and waveform errors. 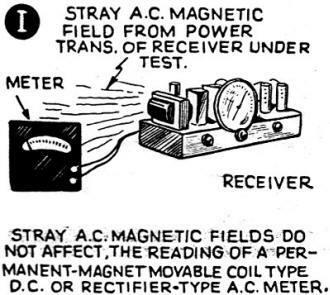 Errors due to variation of frequency (A.C. measurements), seldom bother the Service Man, because these errors are negligible for the frequencies of the A.C. circuits he has occasion to make measurements on. The same is true of waveform variation, which is, to a certain extent, analogous to variation of frequency. (D) Mechanical errors. The quality of the control springs used in an electrical instrument has a very important bearing on its permanency and accuracy. The springs are such important items in the meter, that the rigid inspection they undergo before the meter leaves the factory of any reliable manufacturer makes them almost certain to be in perfect condition. What may happen to them later will be discussed. Another ·mechanical error may be caused by friction in the jeweled bearings. This trouble also, has been reduced to insignificant proportions by proper inspection at the factories. However, as we shall see presently, rough handling, or excessive wear may cause this trouble later. (E) Calibration errors. The scales for very inexpensive instruments are engraved or printed all in one batch, on the assumption of a particular deflection law for a given type instrument; generally the individual instruments are then adjusted by trial to make their deflections fit the scales as closely as possible. Naturally, such meters do not give accurate readings; but since the sale price is so low, the cost of individually calibrating each instrument would be prohibitive, and there is no other alternative. A good electrical instrument is as fine and delicate a piece of mechanism as a fine jeweled watch. It should be handled with just as much care as such a watch, if its original accuracy is to be maintained; for many things may happen to it at any time, impairing its accuracy and reliability. Such a simple thing as a bump, or a fall, always possible with portable instruments, may have serious consequences. With permanently-installed instruments, a knock or a blow, continual vibration, effect of powerful nearby magnetic fields, overloads or other disturbances - any of these may affect instruments to such an extent as to make their readings unreliable. (F) Bent pointer and overload. If too great a voltage is applied across the meter terminals (or stated in another way, too much current is allowed to flow through the meter coil), the pointer may strike against the end stop with sufficient violence to bend it. See Fig. 2A. If this occurs, never bring the pointer back to zero by means of the zero-adjusting screw, for this will not bring the indications into even approximate agreement with the scale markings. It will bring the moving coil into an initial position far different from that which it occupied when the initial calibration was made. See Fig, 2B. The correct thing to do is to straighten the pointer itself, in order to bring it back to zero. (Fig. 2C.) Errors due to bent pointers are quickly detected (in most instruments) by a lack of parallelism between the pointer shaft and the scale markings. How much overload a given meter will stand depends upon its design, and how the overload is applied. Overloads of reasonable magnitudes will not harm properly-designed instruments. If the overload is applied for only a short time, and gradually, so there is no violent movement of the pointer, the instrument will most likely stand considerable overload without damage. (The meters of at least one prominent test instrument manufacturer are designed to stand overloads as high as 10 times the normal value.) However, if the overload is applied suddenly, so the movement is violent, a much smaller amount of overload will surely bend the pointer and also possibly dull the pivots or pit the jeweled bearings with resultant lagging and sticky action. 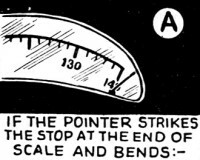 Incidentally, an overload of the wrong polarity, forcing the meter needle backward off-scale is very hard on meters and should be cautioned against. It is always good policy to start measuring an unknown quantity with the range selector of the instrument in the highest range position, gradually backing it down until a range is reached where the needle deflects without going off-scale to the right. This, of course, is the range where the user will receive his most accurate results, and this policy of working down to the proper range will save many a meter from a burn-out due either to too much deflection forward or, a disastrously high voltage or current of the wrong polarity (as far as the meter connections are concerned). (G) "Zero" shift. If accurate readings are desired, it is apparent that the pointer must stand exactly at the "zero" point on the scale when no current or voltage is applied to the instrument. If the pointer is not at the zero position to start with, it is evident that all indications at other points on the scale will be in error. Practically all commercial-type meters are provided with a zero-adjustment screw (see Fig. 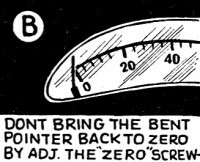 2G), which varies the tension of one of the control springs, allowing the meter pointer's "at rest" position to be adjusted over several scale divisions, so that it may be centered exactly over the position marked "zero" on the meter scale. 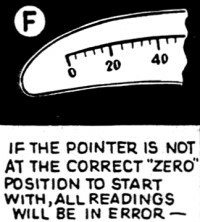 Always make sure that the pointers on your instruments are in the correct "zero" position before taking readings! If the zero error is found to be beyond the range of the adjusting screw, or if a sudden zero error of considerable magnitude is observed, it is safe to assume that the instrument needs checking and possible repair. When "zero"-adjusting a meter be careful to a void "parallax error" (explained later). 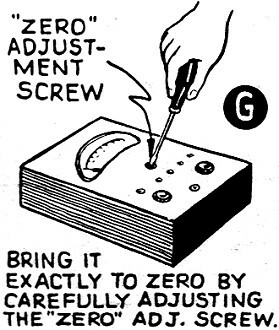 This is particularly important when "zero"-adjusting most ohmmeters, for in these instruments the "zero"-adjustment screw does not adjust the meter pointer position directly but usually adjusts a resistor which compensates for variations in the potential of the battery supplied with the instrument. A fresh battery will, of course, apply a higher voltage to the instrument circuits than after it is partially discharged. Furthermore, because the resistors used in these meter circuits are not absolutely precise in value, there is some variation between the accuracy of the various ranges of the instrument. Therefore, each range of the instrument should be "zero"-adjusted separately - just before using. The Megohm ranges of ohmmeters are usually powered by a miniature power supply working from the house or shop line voltage. Variations in this line voltage can be, and should be compensated-for by means of the Ohms Zero Adjuster, or whatever the manufacturer calls the "zero"-adjusting control. Do not confuse simple "zero error" with that due to a bent pointer. 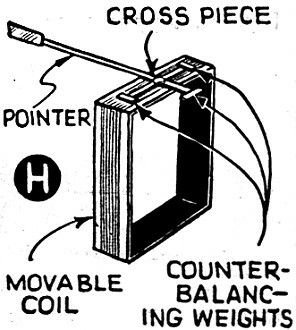 If the pointer is very much off-zero because it is bent, it should not be brought back to zero by manipulating the zero-adjusting screw; for such an adjustment brings the moving coil into an initial position far different from that which it occupied when the initial calibration was made. The bent pointer itself should be straightened! (H) Spring errors. 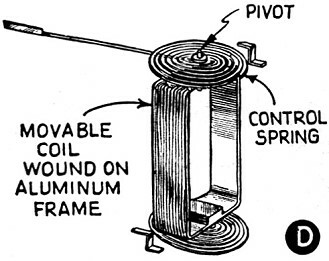 The springs play one of the most important parts in maintaining the accuracy of the instrument; for they not only conduct the current to the movable coil, but also supply the "restoring" torque (or twist) which resists the "actuating" torque of the movable coil, and then returns the coil and pointer to the "zero" position when the current is shut off. Any change in the "restoring" torque produced by the springs will cause a change in the position of the movable coil and pointer - causing an error in the readings. Within the past few years, phenomenal metallurgical advances have been made in spring design which almost eliminate the "fatigue" and "aging" of springs which manifested themselves in a "drift" of calibration in older instruments. The improved springs used in instruments of reliable manufacture render negligible any probable error from this source, so long as they are not subjected to mechanical or electrical abuse. Of course, if the springs have become overheated by prolonged abnormal current flow, they will lose some of their "temper". This will decrease their "restoring torque", and make the instrument mere sensitive. (See Fig. 2, D and E.) Consequently, its readings become inaccurate insofar as its original scale calibration is concerned - and such errors may often be of considerable magnitude. 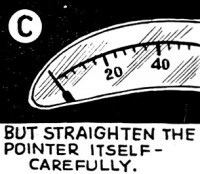 This abuse of the springs by prolonged overload is difficult to detect because, as a rule, the meter seems to operate in a perfectly normal manner, no sluggishness or stickiness being evident. The springs may also become "kinked". This fault will frequently manifest itself by the fact that the reading at a certain point of the scale will be different on "increasing" from "decreasing" values. Another error may creep in from "softened" springs which sag. These cause uneven torque, and an abnormal "zero error" of the pointer. In general, the control springs of an instrument should be maintained in as nearly perfect a mechanical condition as possible by not abusing the instrument by serious overload, rough handling, etc. If the springs of an instrument have received any form of damage, it should be returned. to the manufacturer, or an authorized repair shop, for repair, if accurate measurements are to be made with it. (I) Bearing friction. The hardened and highly­polished steel pivots· and the almost-frictionless sapphire jewel bearings which support the movable coil are subject to wear and damage. (See F.ig. 2E.) They are finely shaped and polished, and accurately adjusted before the in­strument leaves the factory; but friction may develop, due to excessively worn or damaged jewels or pivots. Rough handling of the instru­ment, overloading, dropping and tampering are all common causes of damage to the bearings. Friction in the bearings usually manifests itself in a stickiness and lag of pointer movement, and a noticeable uncertainty in its zero position. Bearing friction will not usually cause errors in the readings, provided the instrument is gently tapped when the readings are being taken; but since its causes are likely to be productive of more serious results, they should be eliminated whenever possible. 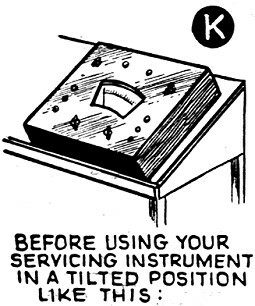 Friction may also be caused by rubbing of the pointer On the scale, or on fine fibres loosening from the substance of a paper scale and projecting out so the pointer touches them. This trouble may become evident only during certain atmospheric conditions, and usually at certain parts of the scale; and it may be difficult to discover. 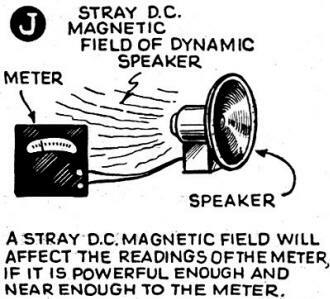 Small particles of foreign matter which have worked their way into the short air gaps of the magnet generally cause "sticky" operation and make the pointer indications erratic. It is interesting to note that "sticky" meters due to foreign substances lodging themselves in the movement seem to rank highest among the most frequent meter repairs not due to owner negligence or carelessness. Sticky action is apt to occur even in new instruments, due to the jarring and shaking received during shipment. Although manufacturers take extreme care to insure receipt of the instrument in perfect condition and despite the care taken in assembling the meters, "trash" in the form of minute metal filings and bits of insulation or fibre may work into the movement. A meter service station should remedy this because the average radio Service Man is not capable of handling the delicate job of cleaning out and adjusting the movement. Anyway, the usual manufacturer's guarantee will generally cover the cost of the adjustment, if it becomes necessary, within about 90 days of the purchase date. A "stickv" meter may be detected immediately. Sticky or defective meters should be repaired at once rather than "borne with" as a man who uses an instrument which is not in 100% working order will subconsciously build up a psychological "mad" at the instrument's manufacturer. If it is repaired, he soon forgets that there was anything wrong with it. "Backlash" in the moving parts is due primarily to loose fits in the. This trouble is not common, nor serious, since errors due to it may be materially reduced by gently tapping the instrument while taking the readings. J) Electrical troubles. Under this classification are those troubles which may develop in the electrical circuits of the instrument after it has been assembled, tested and calibrated. Poorly-soldered joints, loose or broken conductors, and partial or complete "short-circuits" or "grounds" are some of them. It is surprising how many loose or badly-soldered joints develop in supposedly well-made instruments, unless the manufacturers are careful to inspect them rigidly at the factory. "Opens" due to breakage of the fine wire comprising the movable coil or that employed for the multiplier resistors in voltmeters, have given trouble in some models of instruments. Of course, in such cases, the meter fails to operate either on one or more ranges - or altogether, so the trouble quickly makes itself evident. These electrical troubles can usually be detected by observation of the instrument for erratic action. When they are detected, they usually require a careful and complete repair before the instrument can again be considered reliable for service. The copper-oxide rectifiers used in rectifier type A.C. instruments can cause an increase in meter inaccuracy. These copper-oxide rectifiers are inherently delicate and can be easily overloaded. The average rectifier of this type will pass a maximum of but a few milliamperes, above which the rectifier "breaks down." This condition appears to be present in any A.C. measuring-meter circuit whether it be strictly a series-dropping resistor type or one in which condensers and resistors are used. 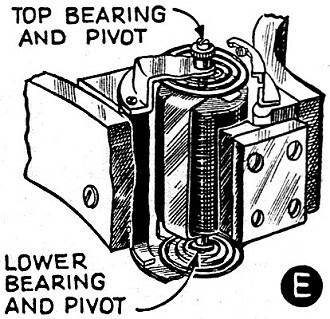 Care should therefore be exercised in the application of A.C. voltages to these meters, for overload often results in a damaged rectifier and lowered A.C. voltage readings. The rectifiers cannot be repaired and are never guaranteed by the original manufacturer. Therefore, damaged rectifiers should be replaced by the instrument manufacturer, or by some reliable meter repair firm, for they sometimes go bad even while being placed in the instrument. The copper-oxide rectifiers should never be touched with the hands as chemicals in one's perspiration will usually cause early rectifier failure. The ratio of the rectified current to the applied current may change for a given rectifier. Troubles such as the above cause this ratio to drop to sometimes half the original ratio. Variations are also possible due to variations of temperature, humidity and the amount of current applied to the rectifier each time it is used for a measurement. In other words, the rectifier will have one ratio when say 0.1-ma. is applied, another when 0.5-ma. is applied, etc. (K) Magnet weakened. Properly designed permanent magnets of the types which are being used in recent high-grade instruments will stand a surprisingly large amount of rough handling before their magnetic strength will change sufficiently to result in incorrect readings. Other parts, such as the jewels and pivots, springs, etc., which are more susceptible to damage by mechanical shock, are more troublesome in this respect. However, the safe rule is to handle your instruments carefully and avoid all mechanical jolts and shocks. There are several inaccuracies which are apt to creep into measurements made with electrical instruments simply because of the way the instrument is used, or the conditions under which the measurements are made. Errors which may be present when a particular instrument is used for one measurement may not occur when it is used again under different operating conditions - and vice versa! Some things to watch for will be pointed out in Part II. Figure 2 includes illustrations of important elements in meter construction, which the Service Man may be interested to note, as, to a limited extent they are self-explanatory. However, the detailed analysis of these elements (Figs. H to O, inclusive) constitutes important, basic knowledge which every technician should possess. This information, and considerably more, will appear in Part II of this useful article. Read Part II of this article; it will discuss Inherent Meter Accuracy (or inaccuracy). 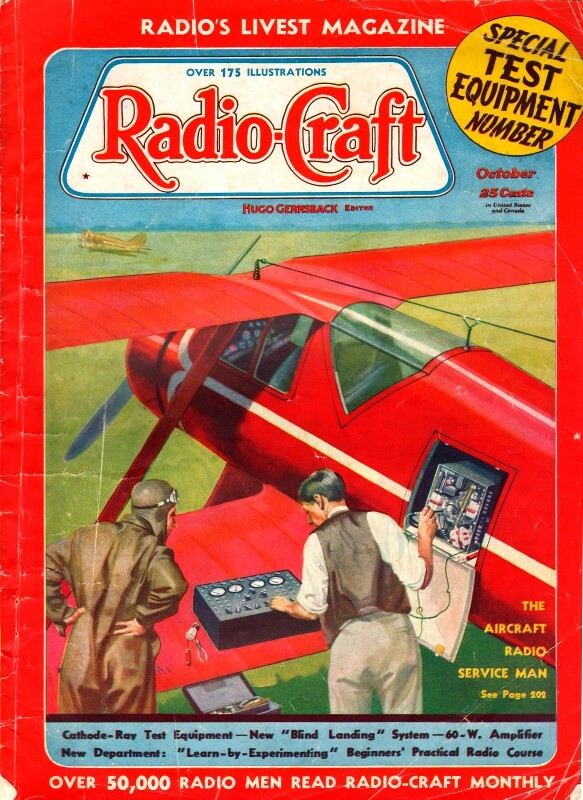 The author of this vital article is also author of "Radio Physics Course, "Modern Radio Servicing," and "Radio Field Service Data" - al of them valuable contributions to the field of literature for the practicing radio Service Man.